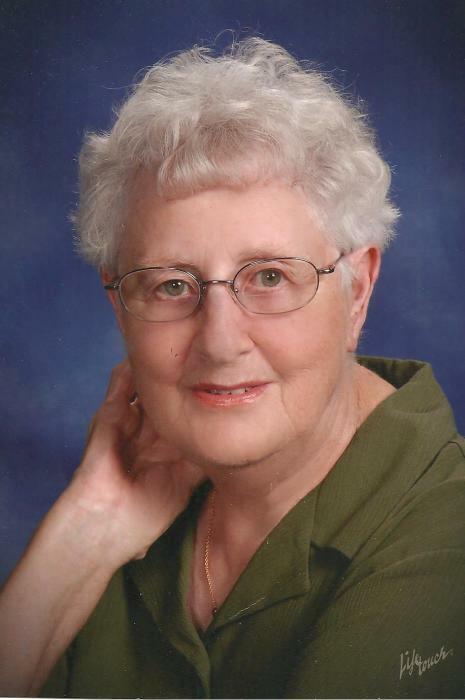 Norine Giebler, 88, Hays, died Sunday, April 8, 2018 at the Willow House in Hays. She was born April 25, 1929 on the family farm in Ellis County, Kansas the daughter of Joseph and Anna (Pfannenstiel) Dreiling. On August 23, 1948 she was united in marriage to Paul J. Giebler in Ellis, Kansas. He preceded her in death on December 6, 1992. Norine was a custodian for twenty seven years at Hays Orthopedic Clinic and was a volunteer for many years at the Arc of Central Plains thrift shop, volunteering twice a week on Thursdays and Saturdays. She was a member of Immaculate Heart of Mary Catholic Church and volunteered to help with funeral dinners there for many years. She was also a member of the Perpetual Adorers and Sisters of St. Agnes Associates. She enjoyed her Tuesday morning prayer group, making noodles for TMP-Marian and for friends and family, ironing and seamstress work, and attending her grandchildren’s and great grandchildren’s sporting events. Survivors include three sons; Donald Giebler and wife Alanna of Stevensville, MD, David Giebler and wife Kathy of Hays, and Dale Giebler and wife Robin of Ellis, a daughter; Joan Dunn and husband Dave of Hays, two sisters; Rose Dorzweiler of Ellis and Norma Schumacher and husband Mel of Hays, eleven grandchildren; Amy Davidson and husband Drew, Andrew Giebler and wife Elizabeth, Kevin Giebler, Krista Whitley and husband Wes, Jamie Schmidt and husband Brian, Kim Terry and husband Billy, Mike Giebler, Michael Dunn and wife Mary, Laura Dunn, Linda Carr, and Joe Giebler, four step-grandchildren; Jason Carrasco, Amber Hernandez, Angela Keller, and Ashley Keller, nineteen great grandchildren; Seraphina, Isabelle, Molly, Danica, Declan, Brandon, Dylan, Sean, Molly, Marshall, Treighton, Damien, Aubrey, Logan, Rylie, Taylor, Daniel, Corbin, and Hailey, five step-great-grandchildren; Talisha “TJ”, Kaylee, Kloee, Kareem, and Ryder, one step-great-great grandchild and one great-great grandchild due this month. She was preceded in death by her parents, her husband Paul, and a brother-in-law; Marion Dorzweiler.